The Pittsburgh Penguins traded Derick Brassard, Riley Sheahan, a 2nd round pick and a 4th round pick to the Florida Panthers for Nick Bjugstad and Jared McCann. Help me out with this one folks, I don’t get it. The Pens are a legit contender, and Derick Brassard is a veteran center. The Panthers are in a sort of rebuild, and Nick Bjugstad is a 6’6” young (ish) centre. Jared McCann is also a former 2014 first rounder with upward potential. Does this trade not seem backwards? It’s even a wash cap-hit wise. Shouldn’t the rebuilding team with cap room be acquiring the young up and comers, and the contender be adding proven grizzled vets at the deadline? 2. Also, I’ve written very little about the Pittsburgh penguins this year. I’m not sure if it’s because they tend to get a lot of press for Sidney Crosby, or another more sinister reason. I’m new to my team being a contender. I feel like if I mention the Penguins I’ll wake them into existence. Like they’re flying under the radar but are a terrible unspeakable evil come playoff time. Do other Eastern Conference contenders feel this way about the Crosby/Malkin two headed Monster? I know Washington and Philly can’t ignore them as their arch-enemy, but maybe a team like Tampa Bay also doesn’t mention them and hopes someone else accidentally bounces them out of the first round. 3. 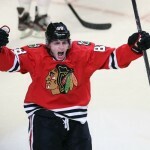 The Blackhawks have won 5 in a row on the back of Patrick Kane’s 27 points in his last 12 games. Has this catapulted them into relevance? No! They just managed to slide into a 51 point tie in the standings with Edmonton, Anaheim and Phoenix who have lost 6, 5 and 4 games in a row respectively. This is such a streaky year! The reigning champion Washington Capitals are just making their way out of a funk where they lost 7 of 8 games including coughing up 8 goals to the Hawks, 6 to the Leafs and 7 to the Sharks and Predators. Braden Holtby seems to have forgotten which end of the goalstick to hold. 4. The New Jersey Devils sent Brian Boyle to the Nashville Predators for a second round pick. Boyle overcoming leukemia in recent years is a great story, and won him the Bill Masterton Trophy last year. But let’s put that on the backburner – Boyle is huge, good on the faceoff, defensively responsible and sticks up for teammates. I loved him as a rental in Toronto, but understood that we couldn’t afford him. He’s also very handsome according to my wife. So yeah, he’s a perfect fit in Nashville. That said, he fits Nashville’s system a little too well. Defensive responsibility is never in short supply for the Preds, but high end scoring talent tends to be what they’re missing. They also picked up Cody McLeod for a 7th rounder as a depth move. 5. The Toronto Maple Leafs signed Auston Matthews to a 5 year contract extension of $11.634 AAV. I will sleep better knowing he’ll be a Leaf for the next 5 years, but already there’s a fuss over how this affects the Leaf’s leading scorer Mitch Marner’s contract negotiations. It starting to look like between this and the Jake Muzzin deal it will be the strongest the Leafs will be before they get into contract troubles. I’m a bit flummoxed by the contract problems, but this is a much better problem to have than any of the other Leaf related problems I’ve experienced in my lifetime as a fan.